The Justice League is the long awaited rebirth of the greatest superhero team of alltime: Batman, Superman, the Flash, Wonder Woman, Hawkgirl, Green Lantern and Martian Manhunter. Currently the new show: Justice League Unlimited, takes the team where they left off when Hawkgirl resigned as one of their member. 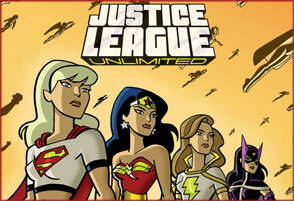 The Justice League has expanded with new members such as: Green Arrow, Supergirl, Aquaman, Elongate Man, and more.